April 4, 2018 – Fire up the grill, Denny’s, because we’re coming for your exclusive Topps trading cards! Two days ago, Denny’s released a well-done ad promoting its new movie menu and collectible cards to benefit charity. 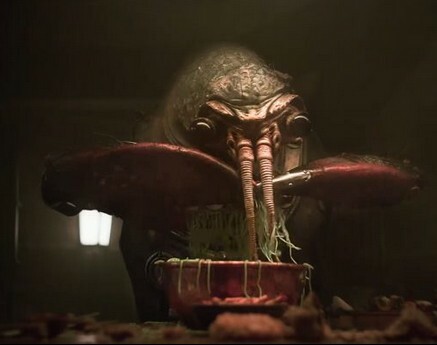 In the commercial ad, Chewbacca grabs a glass of blue milk while other exotic alien species are seated at various tables and at the bar consuming their meals. The camera then zooms in on tyke-sized versions of Han and Lando, who are seen playing a card game and engaged in a stare-down. The ad next flips to a Denny’s dining booth, where the two kids are seen trading the Topps collectible cards. Available only at Denny’s, each Solo: A Star Wars Story trading card pack includes two of 12 different character cards. The packs include random assortments of young Han Solo, Chewbacca, Qi’ra, Lando Calrissian, Therm Scissorpunch and more, in addition to a Denny’s coupon for future use. Net proceeds will benefit the “No Kid Hungry” charity, which seeks to end childhood hunger. Twelve “Solo: A Star Wars Story” Topps trading cards are available at Denny’s. Flip the cards over to create two mini-posters. Denny’s new Star Wars menu includes dishes with names such as Blaster Fire Burger, Lightspeed Slam, Two Moons Skillet and Co-Reactor Pancakes. The restaurant is also selling collectible cups featuring characters from the film and topped with a Millennium Falcon lid. Founded in 1953, Denny’s operates over 1,600 restaurants in the United States, Canada, the United Kingdom, Mexico, the Dominican Republic, El Salvador, Curaçao, Costa Rica, Guatemala, Venezuela, Honduras, Japan, New Zealand, Qatar, the Philippines and the United Arab Emirates. This entry was posted in Cool Videos!, Star Wars Anthology Films, Star Wars Collecting, Star Wars Prequels and tagged "Solo: A Star Wars Story", Han Solo trading cards, Star Wars Denny's trading cards, Star Wars Topps trading cards. Bookmark the permalink. Check out the latest newsletter from JTA sponsor Brian’s Toys… This week Sideshow has delivered on a masterful piece, the Legendary Scale Yoda. One of the most powerful Jedi in the universe can be yours today! Also check out the … Continue reading → The post Sponsor Announcement: Brian's Toys appeared first on Jedi Temple Archives. I found the following photo on Reddit, where it was posted by a user who asked if this is a rare factory error… So what do you think? yes, it’s an ultrarare factory error and this figure is worth at … Continue reading → The post Quiz Of The Day appeared first on Jedi Temple Archives. The Mandalorian will debut its first episode in November on Disney+. Hasbro most certainly has a number of figures for the show in development or production even. Time to talk about what you want from Hasbro for the Mandalorian – … Continue reading → The post What Do You Want For The Mandalorian Toyline? appeared first on Jedi Temple Archives. We review Star Wars: Age fo Rebellion - Grand Moff Tarkin #1 from Marvel Comics. The post Comic Review: Age of Rebellion – Grand Moff Tarkin (2019) #1 appeared first on Jedi News. Listen up.... Talk Star Wars episode 164 is here! The post Talk Star Wars Episode 164: Master And Apprentice appeared first on Jedi News. Grab a torch and a very big stick and head into the Wampa's Lair for a special episode. The post The Wampa’s Lair Special: It’s A Maulvelous Life appeared first on Jedi News.